with the Energy Sentry, bills have not been above $350 and we're just as comfortable." 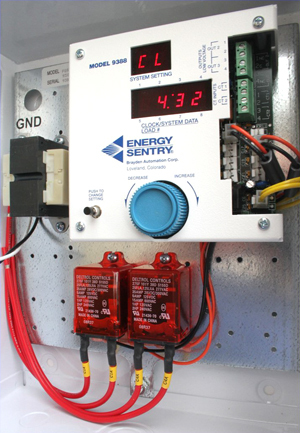 We are so pleased with the savings we are getting with the Energy Sentry from Brayden Automation that you installed almost a year ago. This is our second Energy Sentry unit. The first was installed over ten years ago at our former home. With the move here last January, our winter bill was nearly $500 the first month! I called you, and quickly had another unit put in. We continue to be delighted with the operation of the Energy Sentry. Not only does it save us on our electricity use, but we are contributing to a greener planet. If everyone had an Energy Sentry, the power company wouldn't need to build as many new plants because usage is suppressed during peak periods. We all know the system has to be built to supply enough power at times of peak usage. Here in our new home, a year later, with the Energy Sentry, bills have not been above $350 and we're just as comfortable. What I appreciate most is the service you offer after the sale. At our former home, you and your staff kept our software updated, and were always available for consultation years after the sale. The monthly monitoring of our Dominion Power bill, and suggested adjustments to the Energy Sentry, have resulted in even more savings. Our thanks to you and the Energy Sentry! It will probably pay for itself in less than 2 years. We feel good about the way we're taking care of the planet and our electricity expenses.